Okay, as of today my 2011 race season has come to a close (well, my major race season is over. I might do a turkey trot or jingle bell run). One thing I was unsure of was what to do with my medals. I wanted to do something special with them. It sounds like for a lot of people, the medals end up in a drawer somewhere or forgotten at the bottom of a storage box. 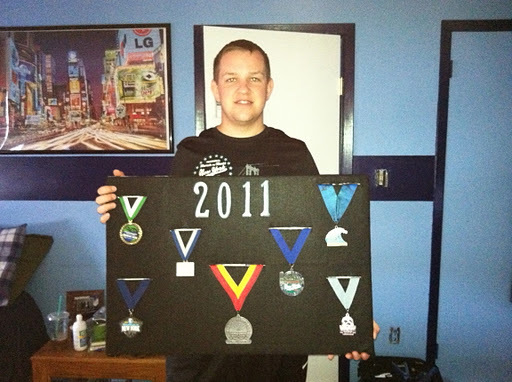 This is what I did with my medals from 2011. 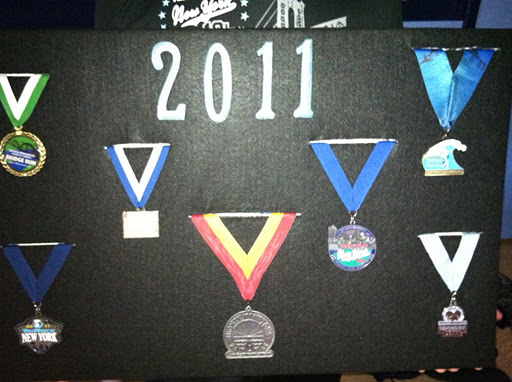 The first step is to map out where you want to put the medals on the board. Then cut 1/8″ slots where you will feed the medal ribbons with the X-Acto knife into one of the boards. Once you have cut all of the slots for your medals, spray the adhesive on the board and carefully lay the felt over the board stretching it tight. Use the X-Acto knife to cut your slots in the felt. At this point you are ready to feed your medal ribbons through the slots. As you do this, position the medal and ribbon, and fasten it to the back. Repeat this step for all of your medals. Lastly, attach the painted numbers for the year. I also used 1 inch Velcro squares to attach the medals down to the felt because there is no glass or anything covering the board. The last step is to attach the second piece of foam board to the back to cover up the ribbons and make the finished product look neat and finished. You may also want to frame the whole thing when it’s done. WARNING: This is permanent! You will not be able to remove the medals from the board after this is done.